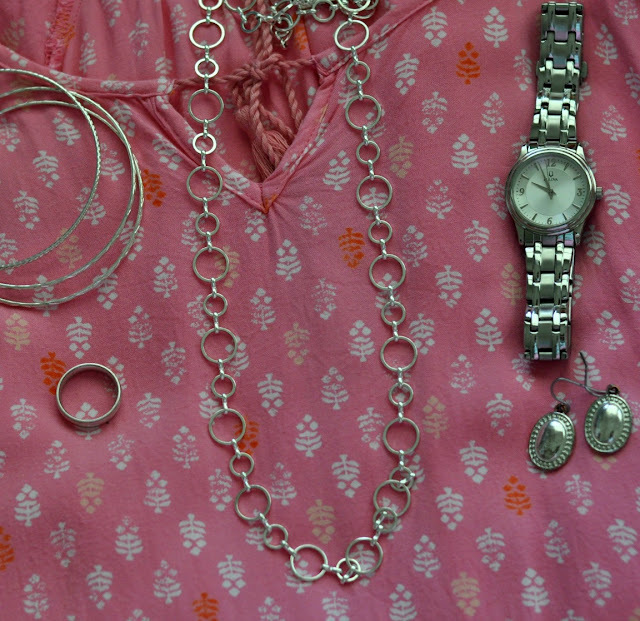 I love the way I feel when I've taken the time to accessorize my outfit for the day. 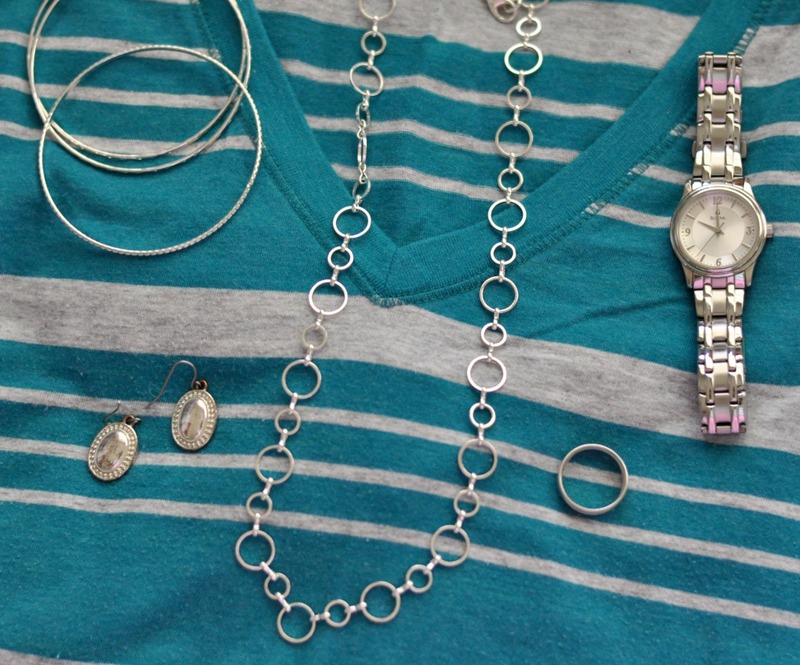 Even jeans and a t-shirt seem more put together with a few pieces of jewelry. One day I hope to be one of those people who lays out their clothes, shoes and jewelry every night before bed so that in the morning there is no thinking involved, but so far that just isn't me. when I slip into my clothes on the way out the door I can grab them and go. Today I'll start with silver, here's my list. 1. 35 " silver chain necklace (similar here and here ) I love this one because it hits me at the perfect length plus it's substantial enough to stand alone. Whether I wear it with solids or a print it adds the perfect statement to my outfit. 2. Silver drop earrings. (similar here and here) I wear these all. the. time. I swear I might just cry if I every lose one. They are not too casual and not too dressy. They look good with my hair down or pulled up. Very versatile and comfortable. 3. A silver watch. I love watches and I have many inexpensive ones but this silver one is my favorite for everyday. It is a Bulova (same) and actually was my husbands ten year gift from his company. True story, when it was time to choose his anniversary gift he handed me the catalog and said here you choose something for you. Sweet guy, right? I have had inexpensive silver watches that look pretty but they turned my wrist green. A less expensive watch can be fun for a date night or special event but not so great for everyday wear. I am a bargain hunter but this might be one item I might splurge a little on. 4. Silver bangle bracelets - Where I might want a higher quality silver watch, not so much with silver bangle bracelets. These are from Walmart and I think it was a pack of twenty for five dollars. I always just grab three or four and wear them on the same wrist as my watch and I'm good to go. They don't rest on my arm so they don't really turn my skin colors and if they turn green themselves I just toss them in the trash. Plus they make great toddler distractions in restaurants...just sayin. 5. One silver ring (similar here)- I am probably dating myself but when I got married in the eighties gold wedding rings were in style and I still love and wear my original ring a lot except when I wear silver. As I mentioned before I don't really feel comfortable mixing gold and silver as a rule. A few years ago I went to Walmart and bought myself an inexpensive stainless steel silver wedding band. Now I switch out between the two depending on which metal I'm wearing. Don't worry I told my husband and he just shrugged. Actually, I think he asked me how much it cost. He probably kicked himself for not getting off that cheaply in the first place. Just kidding...sort of. These five things are literally gathered in a dish in my hallway right outside the bathroom door. That way after I've done my hair and make up and brushed my teeth I can reach for them, slip them on and feel put together. 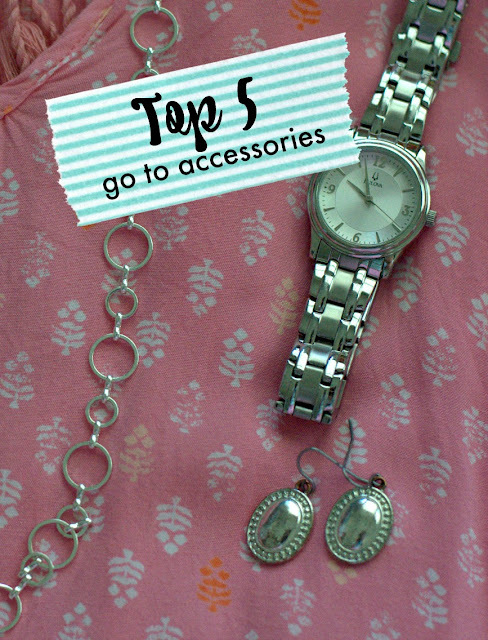 On those days when I have a bit more time or for special occasions I have a whole arsenal of other jewelry that I can substitute but for everyday real life carpooling, errand running life, these five are it. So what do you think, did I miss anything? What would you add or subtract from the list? I'll share my choices in gold next time but for now, that's it for this fashion Friday. Have a wonderful weekend and don't forget to dress cute! If you liked this post, you might like this post where I talked about styling jeans and a t-shirt as well. But Patty- if we selected our clothes the night before, it wouldn't be as much fun! I love your 5 choices and I LOVE bangles. Those are perfect pieces to wear with anything. If I am just around the house, I don't wear any jewelry. I do always have diamond studs earrings on. I like to wear jewelry too, but I tell ya, I am more often than not, in my comfies, just around the house. You know.....a Schlumpadinka!!! I love your 5 choices too and can't do without them. Now I say, go get you a ring or bracelet that has gold and silver and go for it! I mix all the time because my wedding ring is gold and that's not changing. Here in Texas we wear a lot of silver so it's a mix for me.